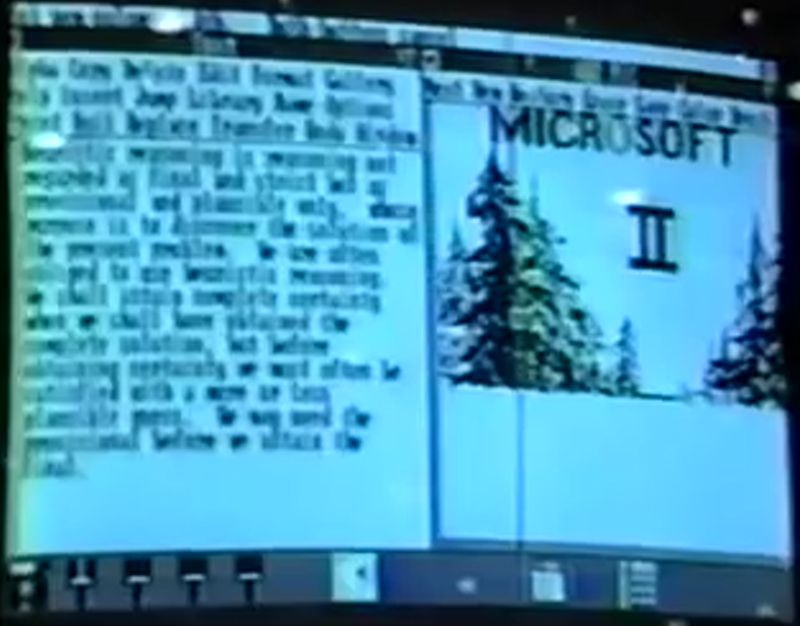 After a couple months of inactivity, I finally managed to complete this part about what Microsoft demonstrated at Fall COMDEX 1983. 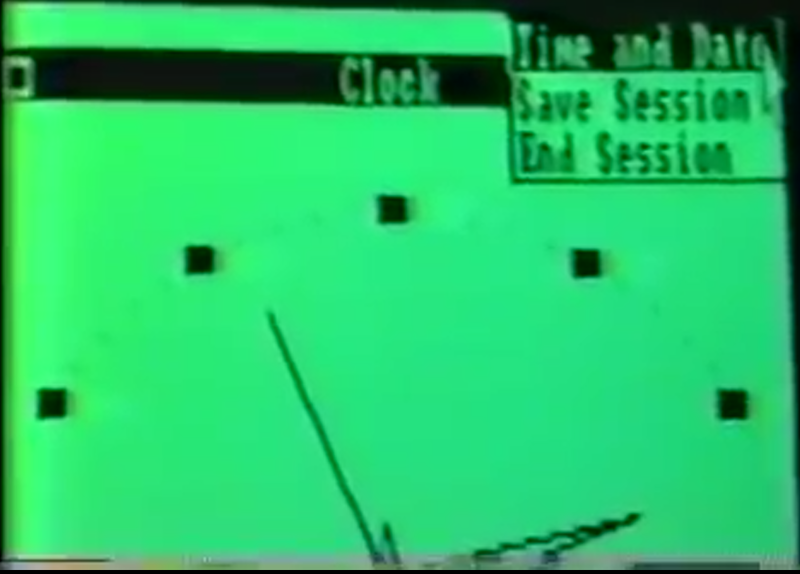 These frames were taken from part 3 of Dan Bricklin's recording of the event (see my previous post in the series for more info about that). 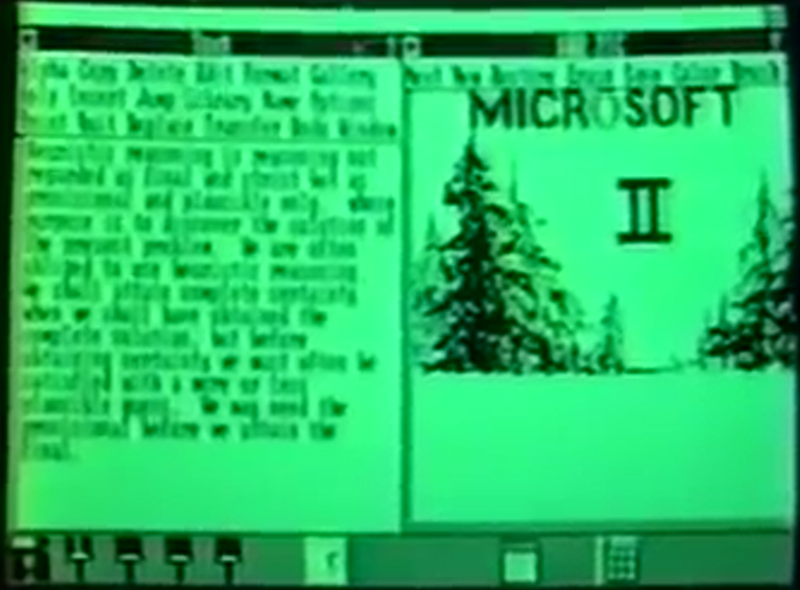 Microsoft had a machine with Windows and a PR lady there to demonstrate its newest and coolest project. As mentioned in the previous part, the video quality sometimes makes it hard to see the details, but it's the best we have. 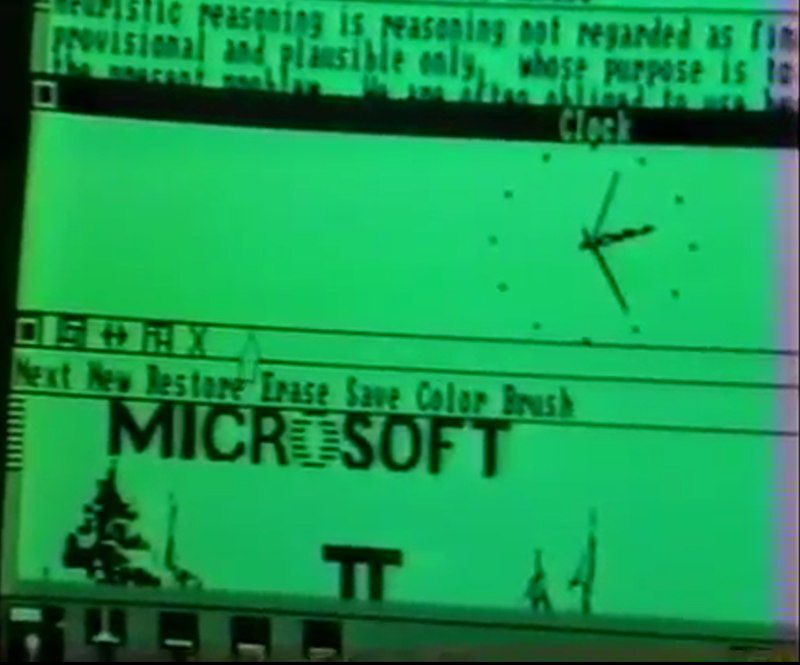 Microsoft stuff begins at about 6:50 in the video. I think it speaks very well for itself, I just wish to comment on some of the interesting parts. 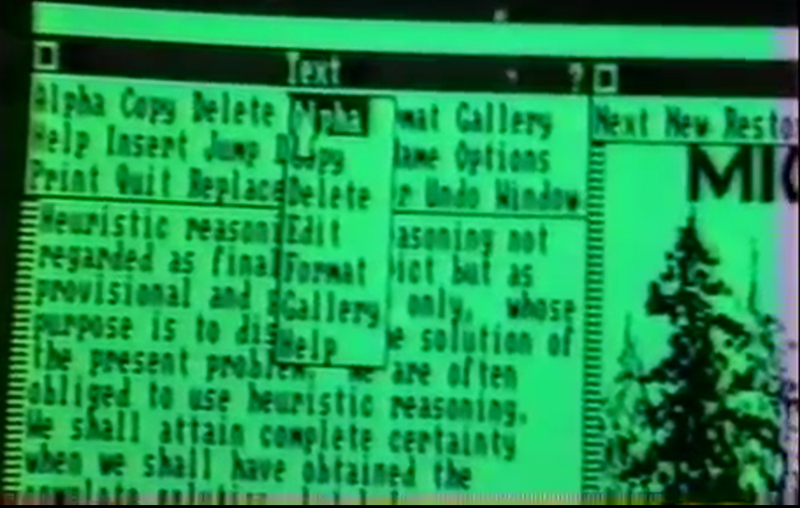 First we briefly look at the larger display above, where we see Text on the left and the usual demo pic on the right. 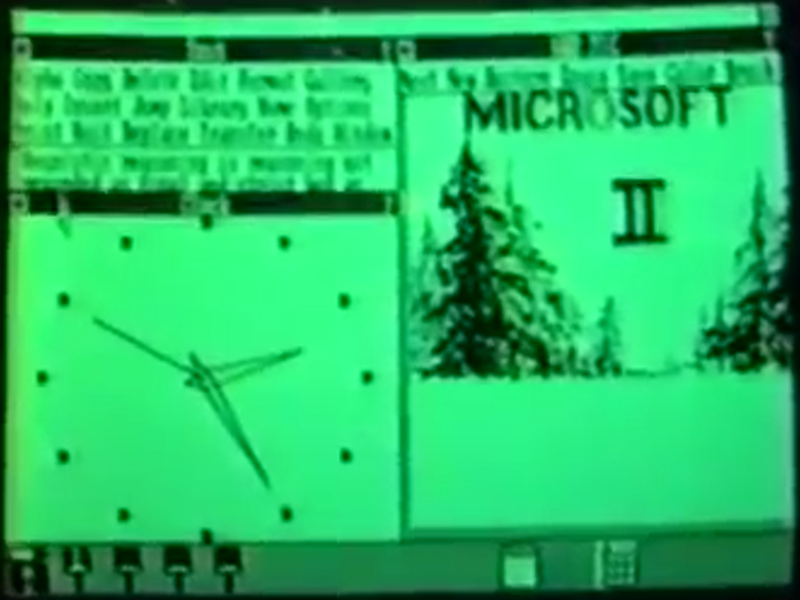 At the bottom there's the MS-DOS window, four more instances of Art, Clock (which already shows the actual system time even in icon form), Calendar and a new, unfamiliar icon, which turned out to be a Spreadsheet app thanks to some other photos I'll discuss in a later part. Next, one of the two windows is resized and we see a tooltip displayed in the statusbar at the top. 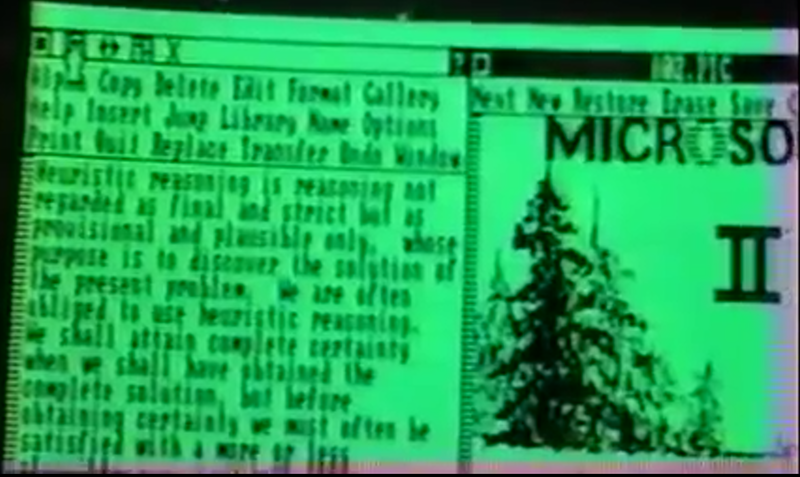 Also thanks to other photos of these early builds, I believe it says "Set new column width. Both buttons cancel.". The Art window is then more narrow. You'll see below that there is a dedicated button for vertical resizing, which then makes me wonder how column width is changed. 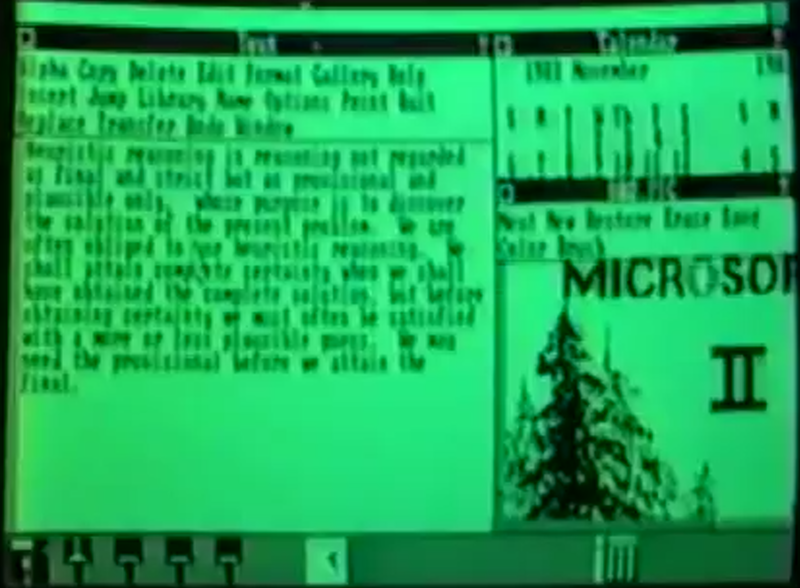 We then switch to the usual computer display and see that the Calendar window was placed on top of Art. 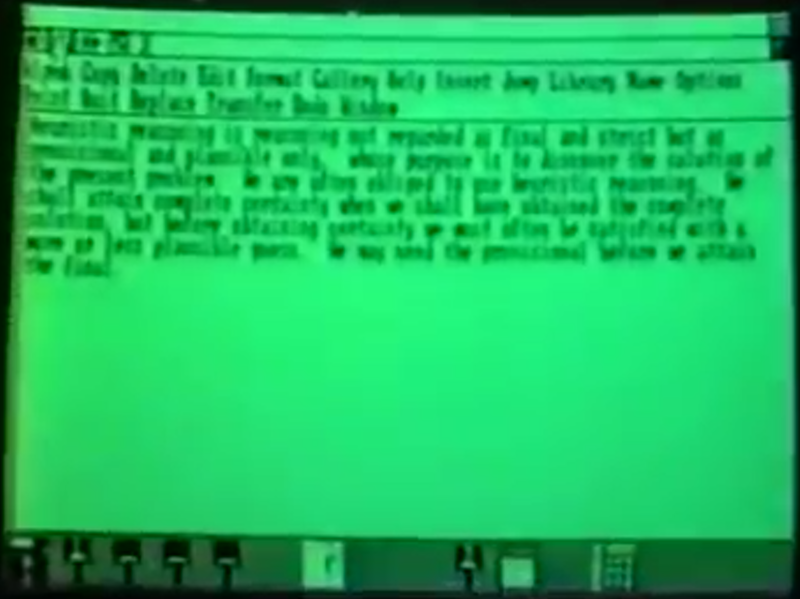 It seems the text inside isn't touching the menu bar at the top, but it's hard to tell. All the windows are then minimized. 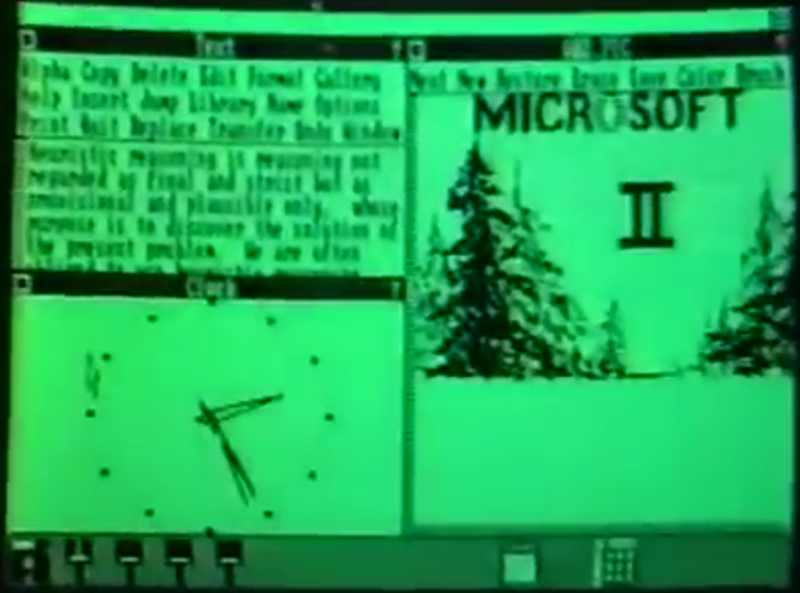 An interesting observation: the PR lady says the Text app is actually Microsoft Word. 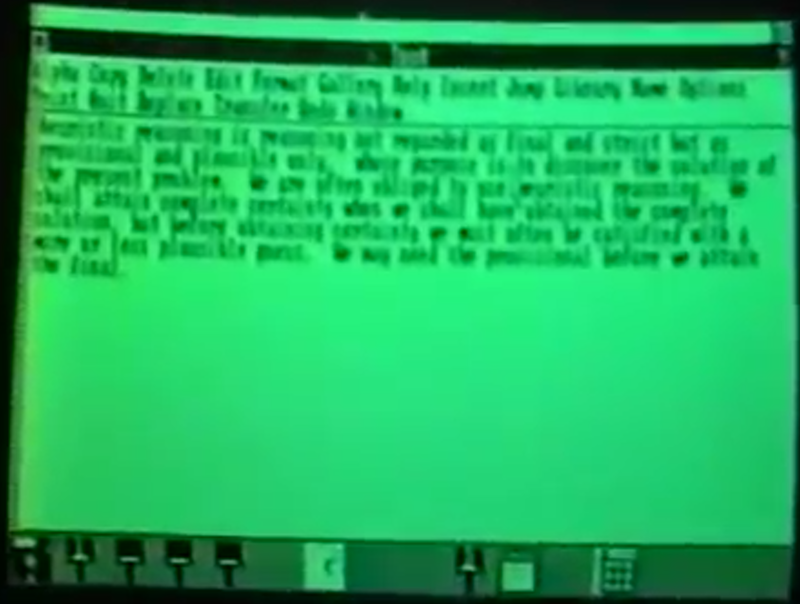 I haven't talked about this yet, but I seriously doubt these demo applications were fully functional, if they were even functional at all. 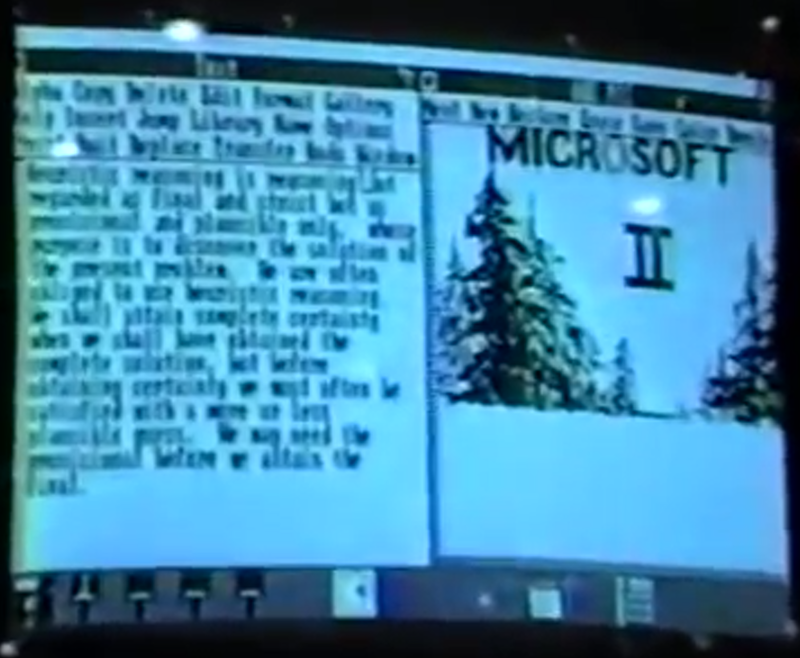 If for example Text was fully functional, it would indeed have to be a complete Windows port of Word, something I find highly unlikely at this stage in development when even the basic OS features are barely there and the whole thing feels like a staged E3 gameplay demo. 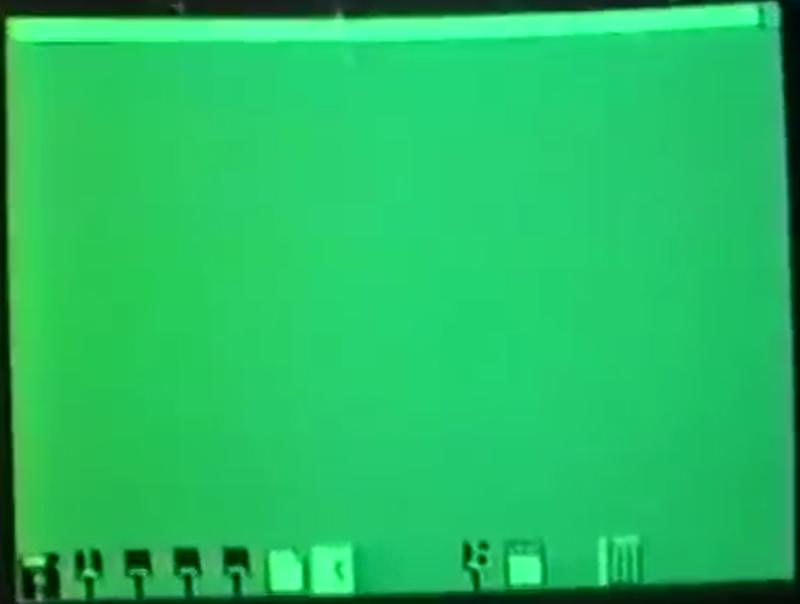 We see the mouse pointer changes when it enters the icon area at the bottom, it appears to be the same cursor still used in the final product. 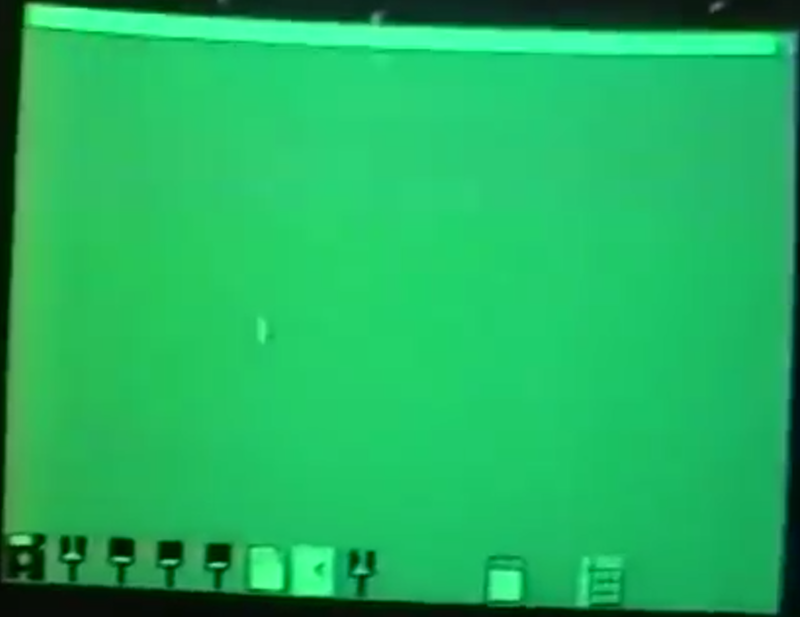 Icons can be moved around the icon area, and clicking on them restores their window. 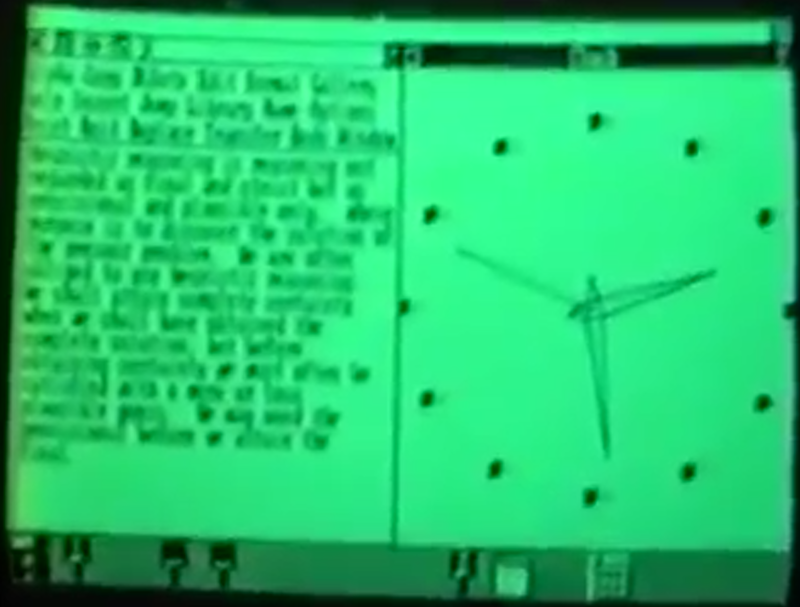 Clock, Art and Text are restored to windowed form. She then explains how tiling works in Windows. As she moves the mouse over the titlebar (or "captionbar", as she calls it) of the Art application, we see it changes color and display four additional icons next to the minimize button on the left. From left to right, these appear to be maximize (makes the window take up the entire column or screen, depending on the layout, it seems), move to the side (moves the window into a column on the other side of the screen), vertical resize, and close (which actually closes the app instead of just minimizing it into the icon area). We see several of these demonstrated. Meanwhile, it's explained that the applications need not to worry about the layout of menus and such, as this is managed by Windows. The applications simply define what the menu items are and what they do. 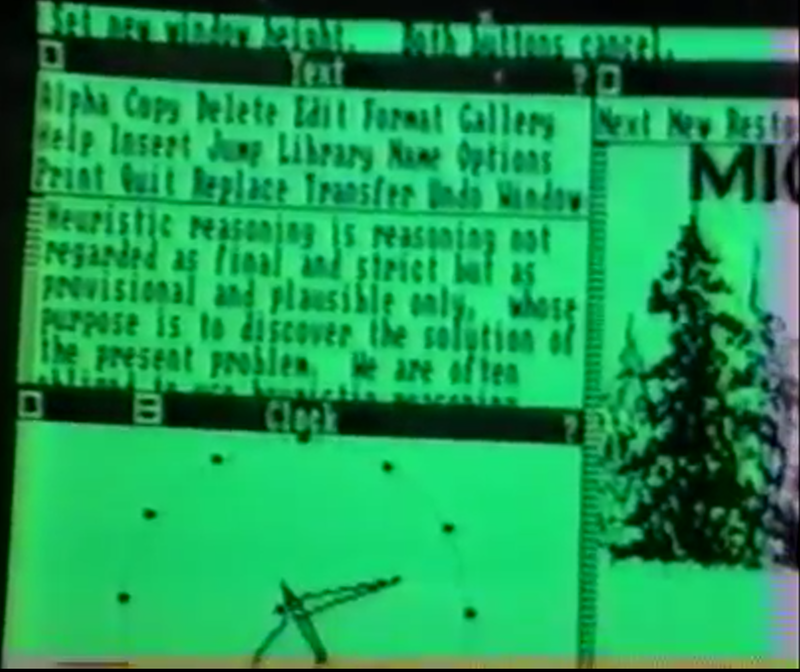 Pretty mind-blowing for some who's never seen a GUI before, I imagine. Not having to worry about such trivial things because the environment automatically handles them for you. In the process of resizing a window, we see the tip "Set new window height. Both buttons cancel." appear in the statusbar. A menu item is clicked and it opens a pop-up (or "pop-down") menu, which is not touching the titlebar anymore like it did in some earlier photos. Along with the menu items, window content also adapts itself to window size automatically (e.g. wordwrap in text editors). 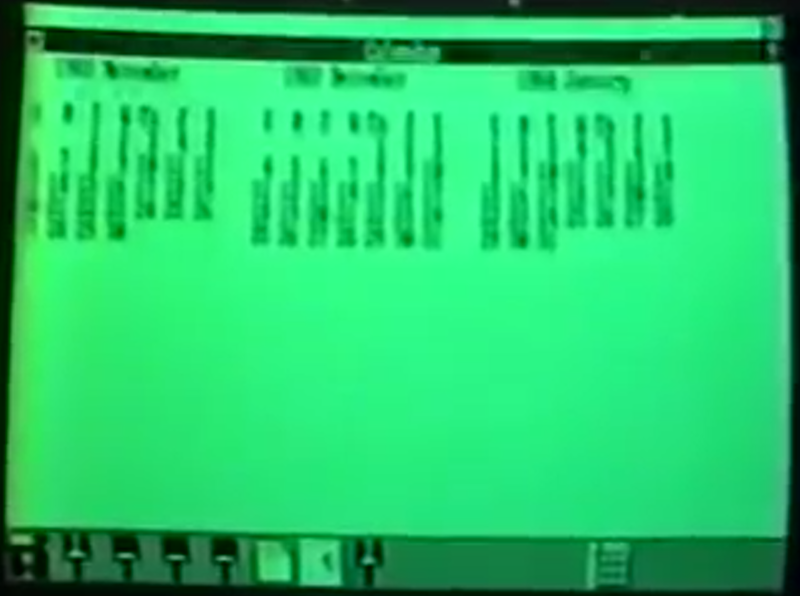 She calls it "extremely fast", which may be exaggerating a bit, but when it redraws entire windows, it really doesn't seem that sluggish either, despite all the apps open in the background. 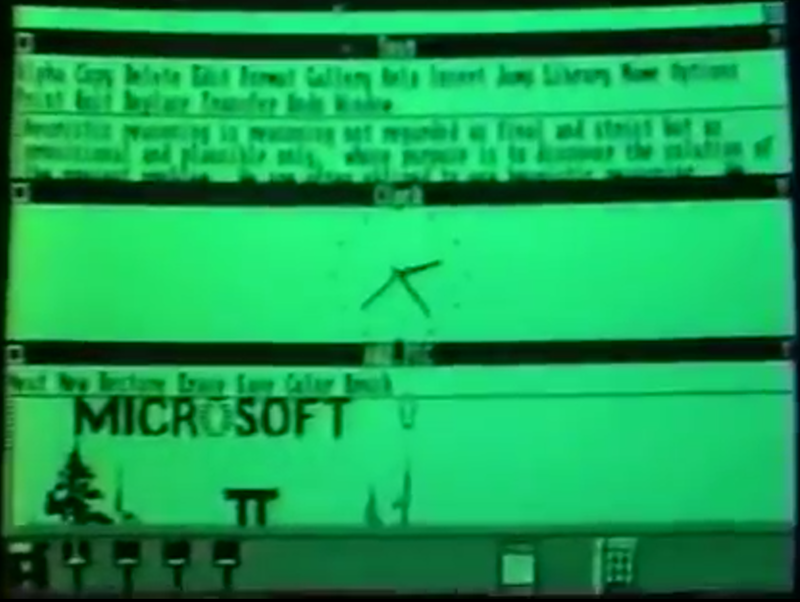 We also see that windows can take up the entire screen, even covering the icon area. The icons are explained as the smallest form of a window for applications, which is actually a pretty good way of explaining how they work in Windows 1.0. One of the Art windows is then "killed" (interesting terminology, to say the least), meaning closed for good. 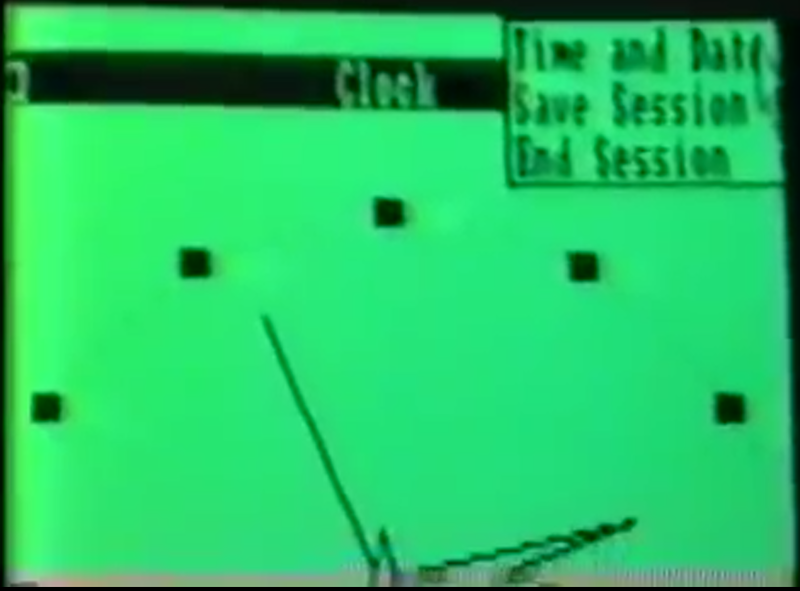 Then we move onto the menu button ("session control") in the upper right corner of the screen, on the statusbar. 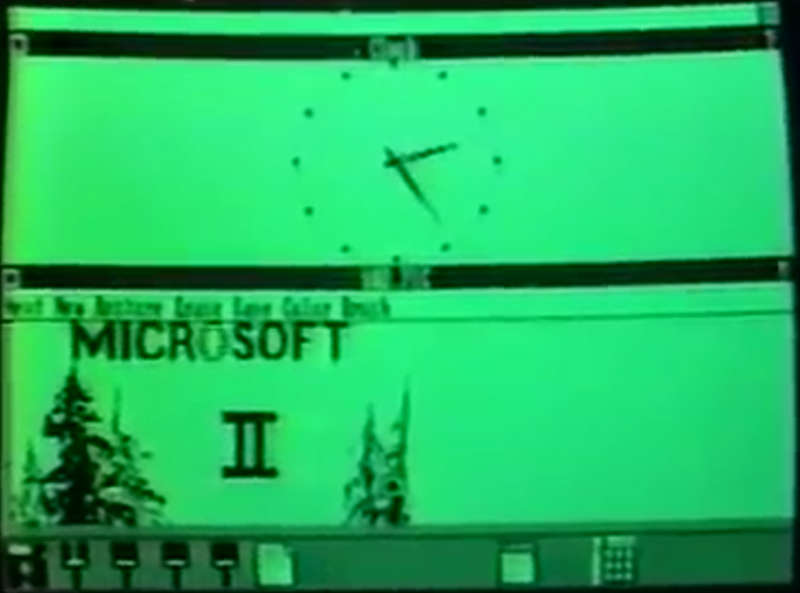 As we already know, it reveals three menu items: Time and Date (displays time and date in the statusbar), Save Session (presumably saves opened applications and the window layout before leaving Windows?) 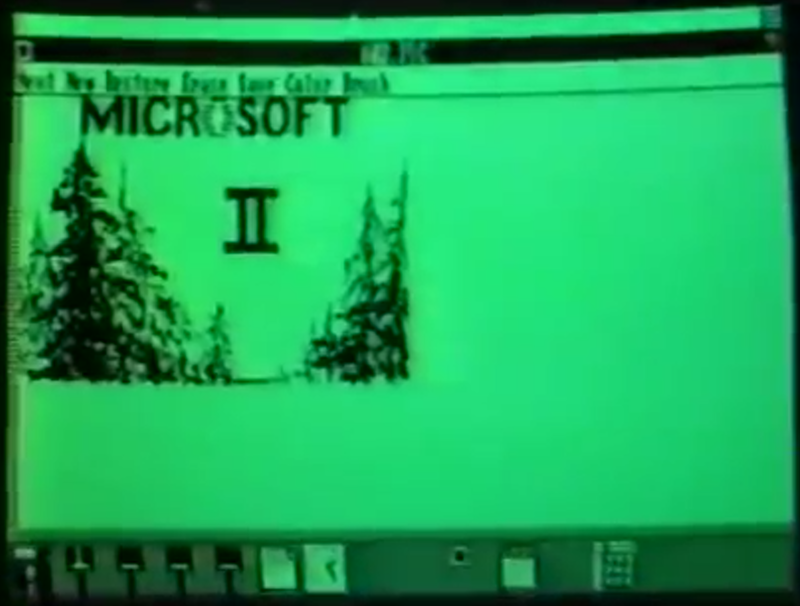 and End Session (closes Windows and returns to DOS). As far as the visuals go, that's it. 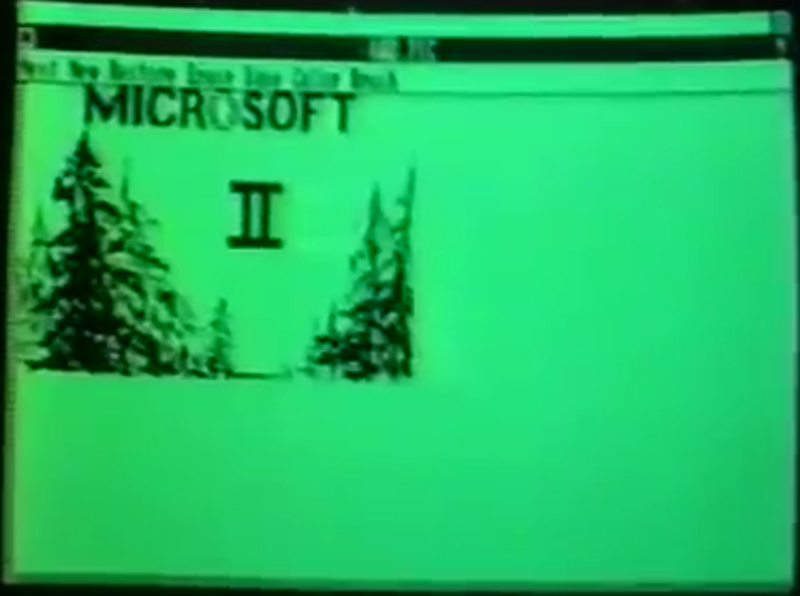 There's more talk about running DOS applications under Windows, including ones that talk directly to the hardware. 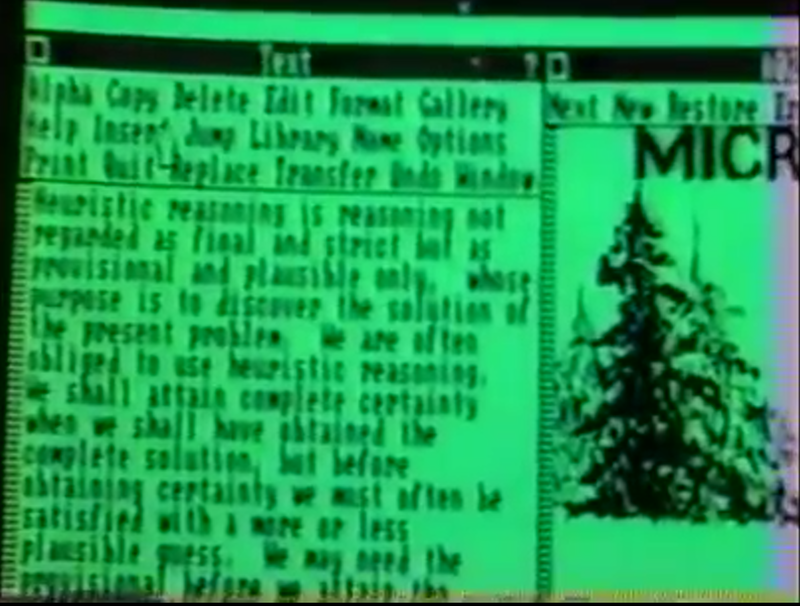 Also mentioned are the memory requirements, described as 192-256 kB of memory for running a few typical applications. 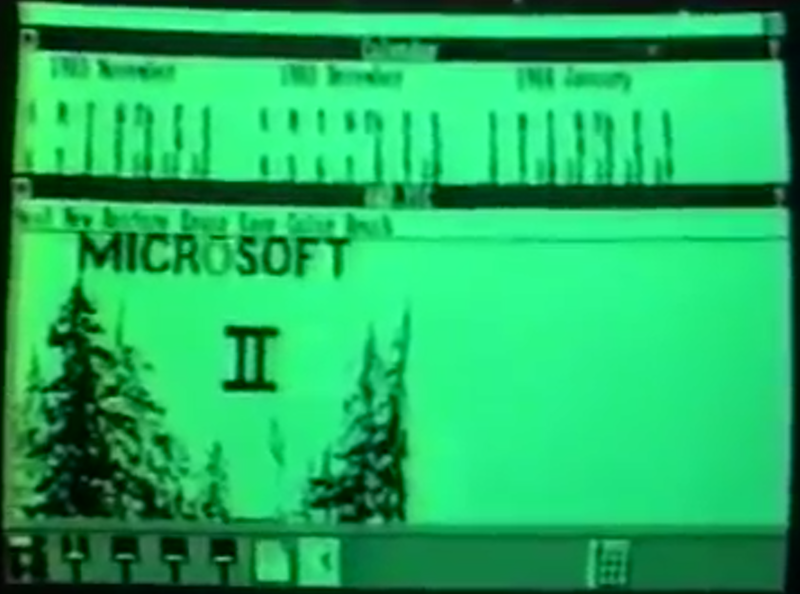 Windows and DOS overhead is roughly estimated at 30-40 kB. 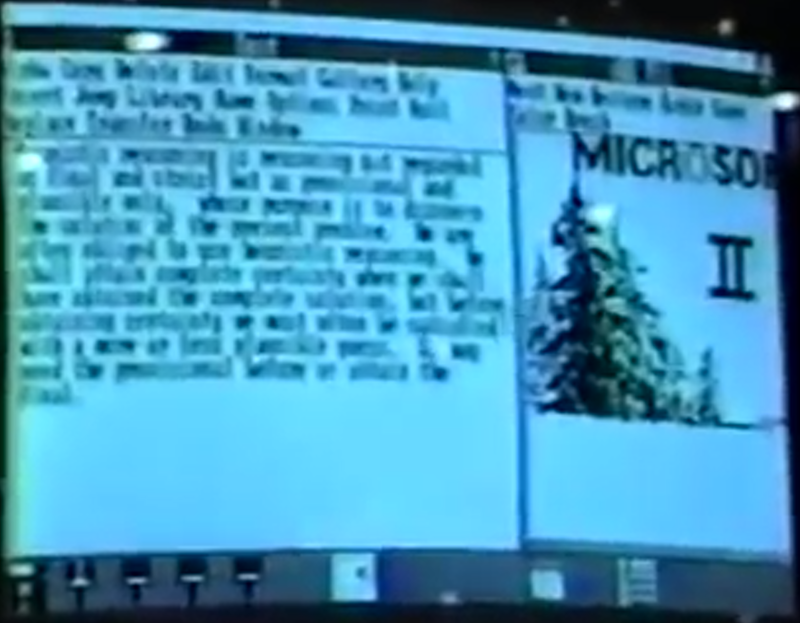 Some hardware vendors that are showing Windows are also mentioned, like HP and TeleVideo. Overall, this was a very interesting demo. 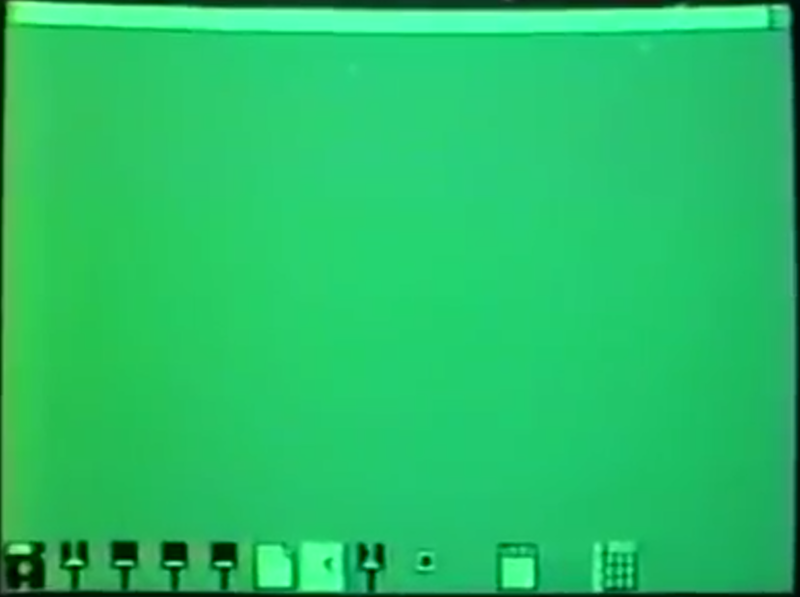 Seeing Windows on video gives us a pretty good idea about the performance at this stage and clears up some confusion regarding the functionality. 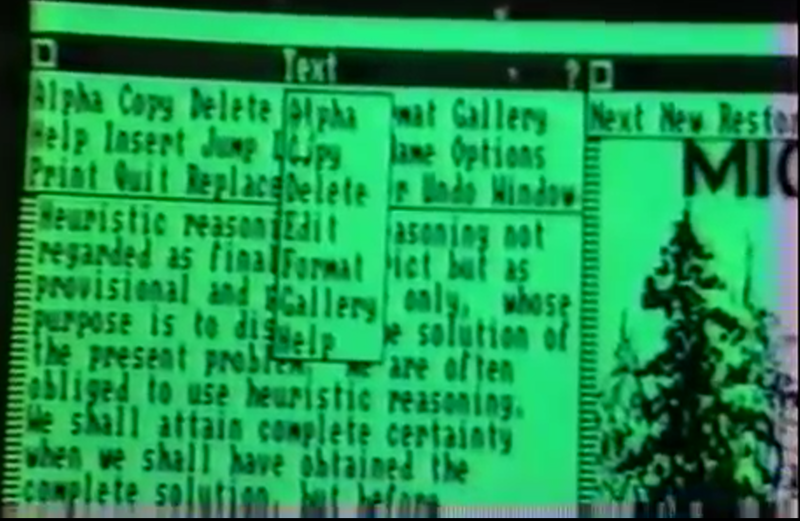 As I mentioned above, I doubt all these advanced applications, like Text and Art, are fully functional. 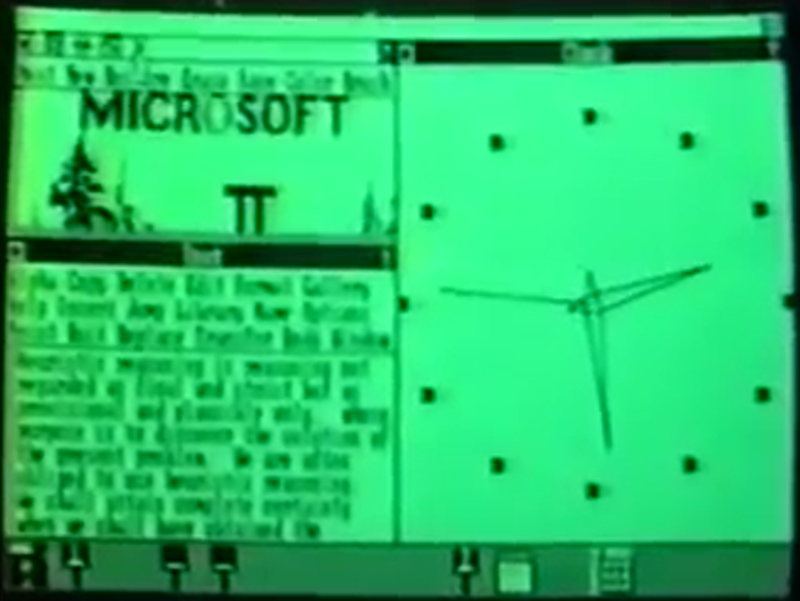 The system itself was so barebones at this point that I just don't see Microsoft writing complete and working applications for it, aside from some clever UI prototyping to make it look more appealing to the public. 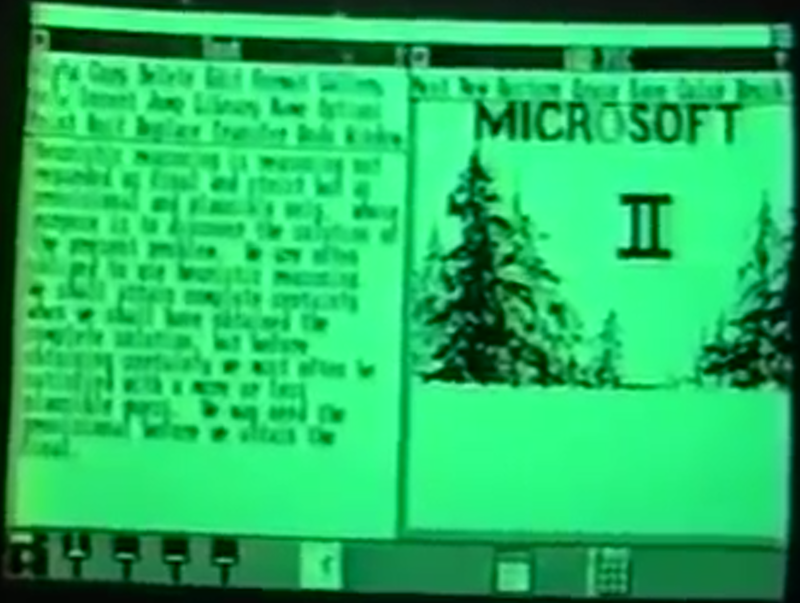 Especially when you take into account the developers first recieved a development kit in May 1984, about six months later (according to press). Now I'll continue to cover various magazine photos from this era, generally up to May 1984, when things went silent for a few months until fall of that year.